Both of the vacuum cleaners in this comparison article fall under the category of “Upright Vacuum”. Upright Vacuums are the most traditional type of vacuum. Generally speaking, they are somewhat bulky, they stand upright, and they tend to be more powerful than, for example, stick vacuums or handheld vacuums. This is because they are one of the largest types of vacuum, so they have more space to have a nice, powerful motor and a big dirt tank. We’ll be looking at the Bissell 9595A and the Eureka NEU182A, to find out the kinds of features that they offer. The Bissell 9595A is a more “lightweight” version of a traditional upright vacuum. It’s smaller, weighs less, and has more overall mobility and versatility. With a weight of only fifteen-pounds, it really is far more mobile than many of the other upright vacuums you’ll find on the market today. You can move it around and carry it throughout your home – up and down stairs, for example – without it being much of a problem. Sure, it isn’t as light or easy to carry as a stick vacuum, but stick vacuums sacrifice power for mobility. Using what is known as “Multi-Cyclonic System”, the filtering process is effortless. Big chunks of dirt and debris are broken away from the smaller particles, and everything is stored safely within the dirt tank. This allows your filter to stay clean for a longer period of time. When your filters do get dirty, though, you can wash them in the sink, and they’ll be good as new in no time. As for the capacity of the dirt tank, it is two-liters, which is quite exceptional, especially when you consider that this is a lightweight upright vacuum. With the press of a button, you can release the contents of the dirt tank into your garbage can, and then put the lid back on, and put it back into the vacuum, enabling you to empty the dirt tank and then to start cleaning again, almost immediately. Of course, very little of this would be important, if the suction and overall power were lacking. It is not. Using the Cyclonic System, the suction is incredibly powerful, allowing for everything to be gathered up, quickly and effectively. This system can be used in conjunction with the TurboBrush Tool, which is a handheld brush tool that allows you to capture the dirt and debris in smaller spaces easily, and on things like stairs and the upholstery in your car. In terms of the extras that this vacuum comes with, you receive an extension wand, the TurboBrush Tool, a dusting brush, and a crevice tool. Each of which allow you to extend this vacuum’s already exceptional capabilities easily. Just like the Bissell 9595A, this, too, is a lightweight upright vacuum. The Eureka NEU182A weighs only ten pounds, and is incredibly easy to move around and carry. Along with this, it includes a stretch hose, an extra-long crevice tool, an upholstery tool, and a dusting brush. With the press of a single button, you can also use the quick-release handle, which can give you up to seven-feet of extra height, when it comes to reaching pesky cobwebs, for example. Each one of these extensions is incredibly useful and is a source of major convenience. What makes it especially convenient, too, is the fact that each one of these things is stored on the vacuum itself, which makes them a lot harder to misplace. As for the dirt tank, it can hold up to four-liters of dirt, which is two-liters more than the Bissell 9595A. Just like that upright vacuum, the filters can be washed off in the sink. With the press of a button, you can release the dirt tank into your garbage can. Using a small dial located on the front of the vacuum, right on top of the motorhead, you can adjust the vacuum for better cleaning. You can set it to “Low Carpet”, or “High Carpet,” to name two examples. 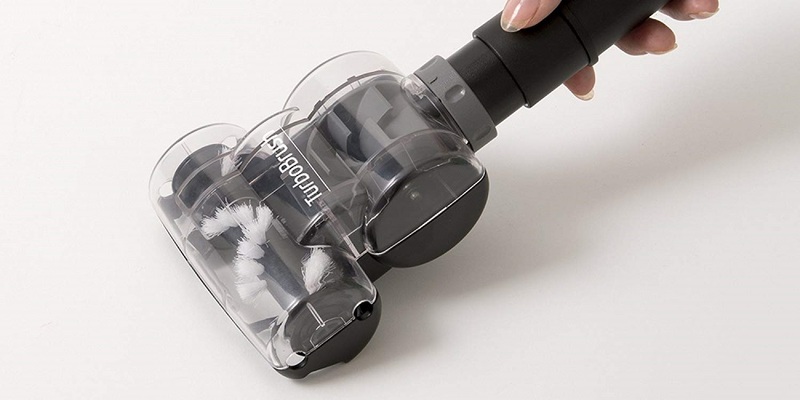 While this vacuum is lightweight, the actual nozzle is nearly thirteen-inches, which enables you to clean surfaces a lot faster, because more dirt is sucked in, due to the width of the nozzle. In the end, both of these vacuums are quite exceptional. However, the Bissell 9595A has greater suction capabilities – due to the Cyclonic system in place – but the Eureka NEU182A has a much larger dirt tank, is lighter, and can vacuum more in a smaller period of time.